Task Force 1, Vancouver’s heavy urban rescue search and rescue team has descended on Port Alberni for Exercise Coastal Response. A Task Force 1 ‘blue’ squad set up a HDT 305 Base-X Expedition Shelter tent at the Fall Fairgrounds on Tuesday night. The heavy urban search and rescue (HUSAR) crew operates with self-sufficiency whenever it moves into an area damaged by natural disaster. Alberni Valley News reporter Katya Slepian is embedded with Vancouver’s Heavy Urban Search and Rescue (HUSAR) Task Force 1 during Exercise Coastal Response. Follow the News on social media for her reports, and watch next week’s paper for in-depth coverage. On most late spring afternoons, the Alberni District Fall Fair grounds are quiet, with only the odd solitary walker out for a wander. But this Tuesday, the grounds were crawling with men and women in navy cargo pants and grey t-shirts, some hauling tents, others walking dogs while still others were trying to nap amidst the organized chaos. 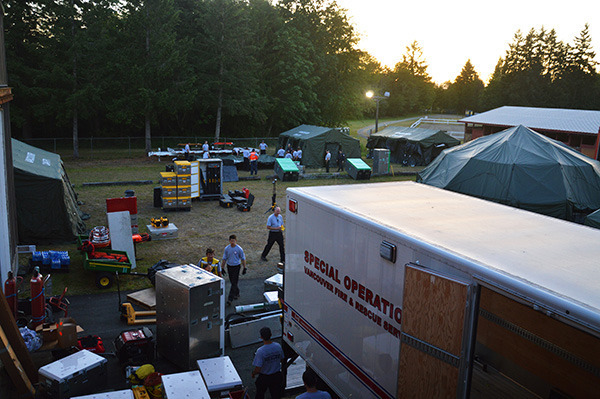 Task Force 1, Vancouver’s heavy urban rescue search and rescue team has descended on Port Alberni for the province’s $1.2 million tsunami preparedness exercise, Exercise Coastal Response. The Fall Fairgrounds are where they’re starting but throughout the exercise they’ll visit more than half a dozen sites around the Alberni Valley. The thudding of equipment being dragged around the fairgrounds punctuates the background hum of a dozen generators. “Aaaand lift,” calls out team lead Wesley Abrams. His squad, five men and one woman, grunt in near unison as they snap tent supports into place. The team consists of four rescue squad members, a paramedic and a police officer—all trained to a standard that takes an extra year-and-a-half of training to reach. The six are just one squad out of many in a team of 75 heavy urban search and rescue crew members who are in town to help with Exercise Coastal Response. Task Force 1 has brought in two teams, who will switch off in 12-hour shifts between June 7–10. From the moment the team got in, they’ve been busy turning the Fall Fairgrounds into their temporary home base. “We set up our BOO, our base of operations. We’ll set up in a particular place in the city that’s out of the disaster zone and we can completely keep ourselves self-sufficient,” said Abrams. It’s almost like its own little village, complete with everything from medical tents to sleeping quarters to showers. “We want to come here and be able to deploy our own little city without straining the resources of a town that’s already in trouble,” said Abrams. In the safety of the Alberni Valley, it’s not quite as extreme as it could be—the team is using the buildings and cooking facilities already present at the fairgrounds, as well as getting food brought it and drinking Port Alberni’s own clean tap water. In a real disaster zone however, the reality isn’t so cushy. Abrams has seen the real deal in his years with TF1, including the 2012 Johnson Landing landslide which killed four people and destroyed five houses in the remote Kootenays community. The team was an integral part of disaster relief at the 2013 Calgary floods. “We did a lot of structural assessment, we pumped a lot of water out of basements, underground parking garages…so moving a lot of water, setting up pipes, working with large hydro-vac systems,” said Abrams. The team will do the same here during the days of mock scenarios. The squads will receive orders at the start of their shifts and have to deal with whatever happens—no spoilers allowed.